Julia Gillard was the 27th Prime Minister of Australia. She was born on September 29, 1961. Julia Gillard has the distinction of having been the first female Prime Minister of Australia. Equally interesting, she was the second person to become the Prime Minister who was not born in Australia, after Billy Hughes. Julia Gillard was born in Barry, Vale of Glamorgan, Wales in a family engaged in medical service. Her father was a psychiatric nurse and her mother rendered her services in a Salvation Nursing Home. Julia Gillard had suffered, as a child, from a nagging lung ailment called bronchopneumonia. Her parents felt the pressing necessity to shift to a warmer country and migrated to Australia to settle in Adelaide. Julia Gillard, at the age of 14, acquired Australian citizenship. Julia Gillard had her graduation from the University of Melbourne in Bachelor of Arts and Bachelor of Laws in 1986. After a brief stint in a law firm Slater and Gordon at Werribee, Melbourne for less than three years dealing in Industrial Law she rose to become one of the female partners of the firm. 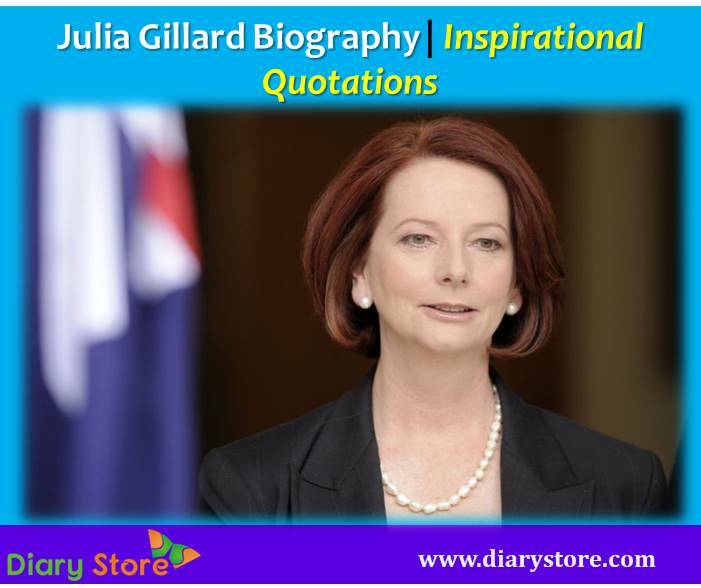 Julia Gillard is more known for her offbeat personal ideology and agnostic views. During her academic career, at the University of Adelaide, she was vociferous in speaking vehemently against the curtailment of in the state budgetary allocation of funds. Subsequently, when she moved to Melbourne in 1983, she led the Australian Union of Students and later held the post of secretary of the Socialist Forum. Between 1996 and 1998, she was the Chief of Staff to John Brumby who was the 45th Premier of Victoria. Julia Gillard was instrumental in re-writing the internal laws of the Labour Party in Victoria and enhancing the women quota for election to the parliament. In the capacity of Minister for Education, she signed the pact with her US counterpart Arne Duncan for enhanced cooperation in educational reforms in the two nations. Julia Gillard became the first female Deputy Prime Minister of Australia, when the Labour Party emerged victorious in Federal Election in 2007. She was also the acting Prime Minister for 69 days, during the absence of Kevin Rudd. In the light of deteriorating confidence in Rudd’s competence among the members of the Labour Party, she got elected to the post of Prime Minister unanimously. Her more notable stance as Prime Minister was her strong support for women to have freedom to choose abortion or prevention of child birth, a policy known as “Pro-Choice”. Julia Gillard openly opposed the recommendations of the policy “Big Australia” which encouraged growth of population in Australia and she instead stood by the idea that emphasized the need for sustainability. She held the post of Prime Minister till 27.6.2013, when the helm was again occupied by her predecessor Kevin Rudd who won with a majority of 12 votes. Her major policy decisions involved the Clean Energy Bill 2011, Mineral Resource Rent Tax, National Broadband Network, asylum seeker policy, Educational Reforms in the light of Gonski Report and National Disability Insurance Scheme.